A break from group projects was both exciting and challenging. Interesting, because I was given the opportunity to try something I feel passionate about, and challenging because I have only my own strengths and weaknesses to count on. Nonetheless, I took this project as an opportunity to create something I can be proud of. I believe that I managed to achieve a prototype for a product / or a range of products that I would love to explore and develop further, over the course of time. That being said, this project would have not been possible without the continuous support of Kate, Nick, Reza, Omid, Nick & April. We see many web and mobile applications and digital media daily, designed for everyone’s favourite target audience – Children. Companies are using unethical means of “persuasive design” to lure kids into spending hours on their gadgets and often hampering their development in the process. There is a lot of debate globally around the exposure that children should have to technology at a young age. However, no one is addressing this seriously just yet. My childhood memories revolve around curiosity. The desire to be on the move constantly, touching things, feeling things, building things and even breaking them! It pains to me see that children today are just handed an iPad to “learn,” and the repercussions of these parental tendencies are probably going to be more drastic than we think. Children are deprived of enjoying the small but glorious interactions with blocks, puzzles and other traditional, tangible toys that were designed with an ethical development framework in mind. Puzzles have been around for generations because they are beneficial in a child’s developmental process. In fact, they’re even suitable for adults. They help build cognitive, problem solving, fine motor development, hand-eye coordination, and collaborative skills. I wanted to create an interactive experience, that combines the best of both worlds. 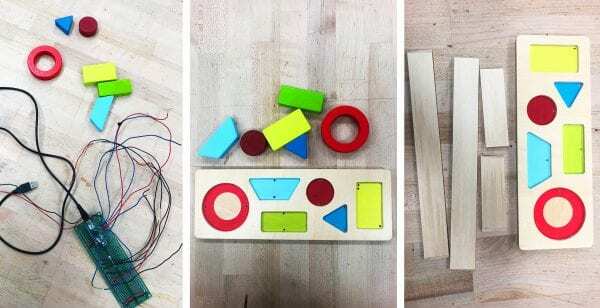 By giving children the toys to develop textural/material based skills, and simultaneously allowing parents to feel the benefit of technology-aided, enhanced educational experiences. The Kid’s Puzzler is a simple shape & colour puzzle for toddlers and young kids, that focuses on using wooden blocks for development. 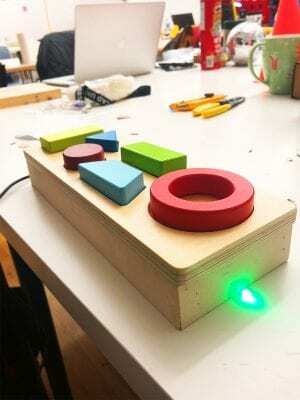 Placing blocks in the right socket on a wooden puzzle board, triggers a delightful digital reaction, that this learning oriented, thus enhancing the learning experience for the child by making it more engaging and rewarding with feedback. This preliminary round of ideation was far from satisfying, and even a bit frustrating. If anything it made me realize that I want to create something that was meaningful and delightful at the same time. My passion for inclusive and accessible design was something I hadn’t really explored in the last three months & it was time to do so. 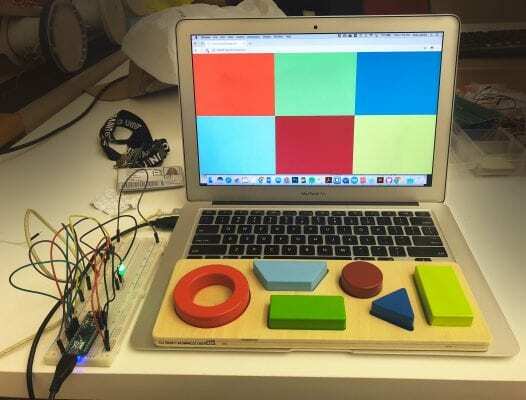 I turned to the Arduino blog for research, to see what other developers are up to with their controllers. 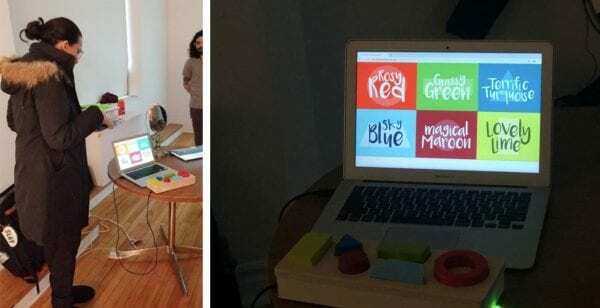 I stumbled upon an emotional project created by parents of a young girl with visual and hearing challenges. 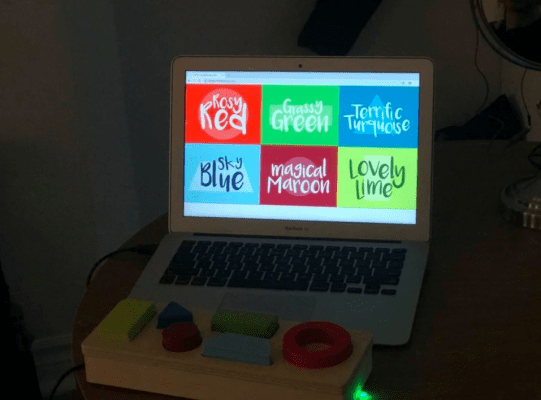 They used an Arduino with a puzzle with objects to trigger LED lights in their room, to personalize their daughter’s learning process to suit her needs. This idea really touched me, and I wanted to create a prototype of my own version of this game for all toddlers. I started researching children’s puzzle games online, and here are some of the interesting ones that I found. Upon visiting a few hobby stores, I was disappointed to find costly versions of these puzzles or to have them unavailable. Sourcing puzzles on Amazon were quite a challenge as the delivery times and costs were unrealistic. So I turned to Reza at the MakerLab to help me build my own wooden puzzle. I found myself at Mastermind Toys, at Mount Pleasant Road, with a charming sales representative, who guided me on the phone before my visit and when I got to the store as well. He was intrigued by my project and pointed out a few boards that he thought would best suit the occasion. Two companies building amazing toys that stood out for me were Melissa and Doug and Hape. The first company had beautiful products. However, I settled on the fantastic Hape Geometric Puzzle, because it was wooden, compact, light, well designed, minimalistic and affordable. For the purpose of this experiment, I decided to work with the first side with six separate shapes. For the programming process, I wanted to take it slow and steady. It was vital to remember the fundamentals before I pursued the execution of my project. I tried all the experiments suggested to us in the class by Kate and Nick and only then did I begin with the rest. At the beginning of the second week, once I had my fundamentals and idea in place, I approached Kate to guide me through the execution. 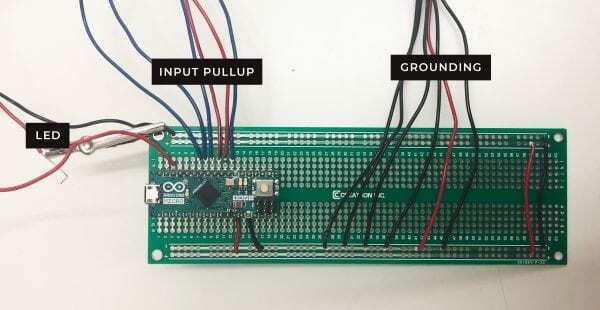 She had a constructive and relevant example for us in class which revolved around the idea of using the pull-up resistor within the Arduino Micro to trigger a button interaction. She showed us how this worked by using three pins to create three buttons that changed colours of circles on her screen. 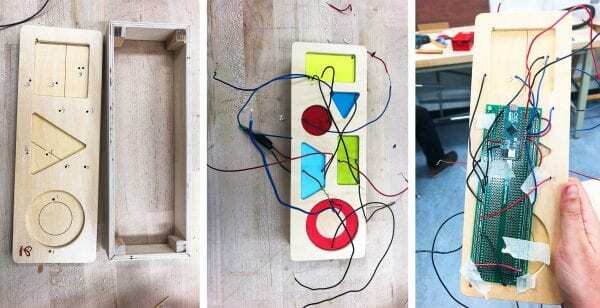 She used conductive textile to complete the circuit. Six of these inputs were precisely what I needed for the foundation of my project. I began experimenting with this mechanism as soon as the class ended, but it was a struggle. Even though my serial monitor was reading the code from six buttons accurately and the circuit with the LED was working fine, the data being transmitted to the browser through the serial control was too fast, and it kept hanging and causing the serial control application to crash. Video: Circuit with six outputs for sensors, working accurately with LED lighting up for each sensor. Video: Serial Monitor logging the sensor readings accurately. I went back to Nick and Kate for help, after trying for over a day because I couldn’t get the p5 code to work. I used the time I had before my meeting with them to make decisions about the interface screen design and to try some options for the were outputs. After several attempts, Nick helped me figure out that the p5 was hanging because the delay from the Arduino code being sent to the serial monitor was too less. This volume of data transmission was causing the p5 to crash. We adjusted the delay timings, got the guts working, and I was finally ready to execute the code for my experiment. With my circuit in place, I used Kate’s code as a base for the p5 to set input readers for the six pins and allocated a coloured shape area to each of them. 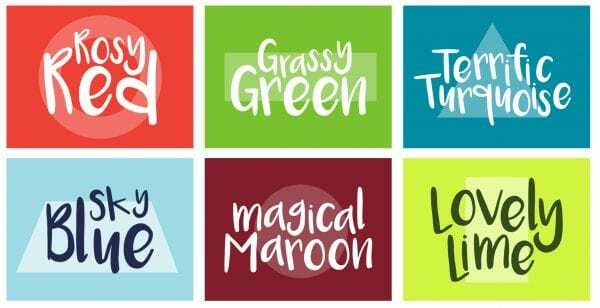 These were simple coniditional statements with 0 and 1 states to trigger colour movements. For the purpose of this prototype, I wanted to focus on colour as the output. Since I have a background in graphic design, I attempted to design cards that would appeal to and excite children. Next, I replaced the placeholder squares with the graphics and tested it with the circuit. Because of all the challenges, I faced with the touch sensor in the last project, soldering this time around was a breeze. I reused 100% of the wire from my previous installation, as well as my LED with its wiring from the last project. The rest of the extra wire was used entirely by Frank for his circuit. So there was zero wastage through this process. Before fabricating, I ensured to test my circuit and made sure that it was working correctly. 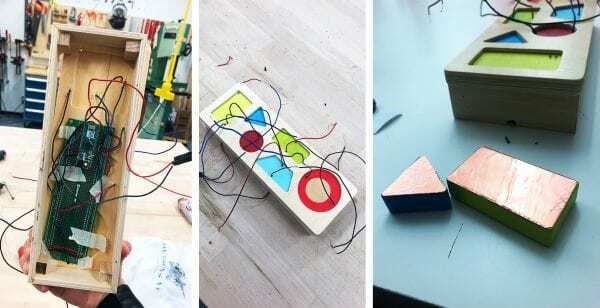 With everything in place, I headed back to the MakerLab. Reza helped me fabricate a beautiful box that matched my board perfectly and even housed the LED light to indicate circuit activation. We laid out the raw materials, drilled two holes for each shape one for power and one for ground, and then Reza cut out the pieces for the base of the box. Then we labelled each hole and pulled the wires through them. We attached the circuit to the back of the board with masking tape as a placeholder. Then we glued the wooden frame together and got ready to assemble the box with our glue gun. With a few shots of glue, the box, LED light and wiring was in place. Next, we trimmed and bent the wires, added copper tape below each shape, and we were ready to test. None of this would have been possible without the fantastic Reza! Once the box was ready, I was eager to test it, and it worked fine. Since I had time on my hands, I wanted to add another layer of interaction with sound, and I began working on that part. While I understand the basics of adding sound since I had worked with the feature on my last experiment, I faced a challenge with ensuring that the music plays only once per interaction. After struggling for a few hours, I turned to my classmate Omid, who was extremely helpful and had faced a similar challenge during his last project. He taught me how to create an additional variable for the sound function and use it to stop the loop, which is the usual flow in p5. I also had the help of my classmate Nick, who has a fantastic voice and a background in theatre. He created beautiful sound bytes that were energizing and melodic to the ears. And alas after a final round of code cleanup with p5… The Kid’s Puzzler was ready! This experiment was both challenging and fun. It was humbling for me to see my cohort and faculty enjoy interacting with this piece. One of the parents in the classroom said their children would really enjoy it as well, and that was a satisfying comment to hear. I would love to add more layers to this puzzle. Currently, I focussed purely on the colour interaction but I would love to add another level for shapes. Kate recommended pushing it even further and experimenting with different shapes interacting with each other, which I would also like to try executing. I would also like to work with other children’s games and puzzles, and even sensors to enhance the existing world of tactile toys. I think they are extremely vital to a child’s development and designers should find innovative ways to keep them around. Why Puzzles Are So Important For Kids Learning?